Tonaki Tinnitus Protocol by ‘Todd Carson’ is a well-produced scam that lacks substance, and you should stay away from it! The scammers behind this product went at great lengths to make sure that their product looks legit … but from my experience, lies and deception are always exposed at the end of the day. This review will demonstrate this perfectly so sit back and happy reading! 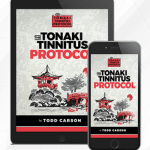 Tonaki Tinnitus Protocol was created in May 2018. It claims to have the ‘breakthrough’ cure that can treat your tinnitus in just 21 days. Todd Carson tells us the oh-so-sad-pity-me story of his wife Jo’s bad tinnitus and how doctors failed to treat her blah blah blah … until he figured out the supposed real cause of tinnitus – the degeneration of a certain ‘nerve fat’. Of course, we’ll get to details later but let’s start with the fun part: The reasons why Tonaki Tinnitus Protocol is a scam. 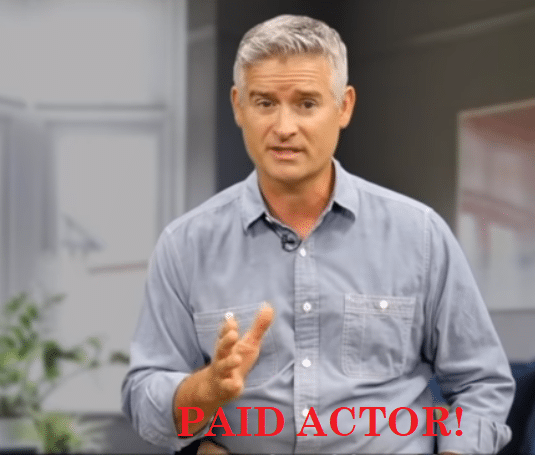 Todd Carson claims to be a 52-year old ex-military police officer who served in the U.S Air Force and the Marines ‘for over two decades.’ That’s a pretty solid resume if only it were true … as I’m confident that the man in the video claiming to be Todd Carson is a paid actor! To start with, this Todd Carson doesn’t have any social media presence. But the next point below is the main reason I’m sure he’s a paid actor. Read on. As you can see, all these scams use the same website design, paid actors, and sometimes even share the same backstory. This company is particularly notorious for doctoring stock images for use as author photos or testimonials. After reading the backstory of Tonaki Tinnitus Protocol, I realized that I’ve read the same backstory months earlier at a different website with a different product. It didn’t take long to figure it out: This same backstory was used in Memory Repair Protocol – another popular scam by Spark Health Media. Todd Carson says he was hungry and ‘a sweet smell’ of food attracted him to the old woman’s house. The same thing happened at Memory Repair Protocol. Of course, to make things different, Tonaki Tinnitus Protocol changed the location from Ballabgarh, India (Memory Repair Protocol) to Tonaki and Okinawa (Japan). But like I said earlier, lies and deception can’t stay hidden forever! Just like in the other scams above, the testimonial videos of Tonaki Tinnitus Protocol are too staged to be genuine, with the multiple-angle camera shots and all. Spark Health Media went a step further by adding untraceable testimonial photos to supplement the videos, but given their history of doctoring photos, there’s no chance in hell that I’ll believe that those photos are genuine. Actually, Carson is outright lying here. Fact is damage to the myelin sheath of the auditory nerve is NOT the only cause of tinnitus. There are many causes of tinnitus, degeneration of myelin being just one of them [RareDiseases.org]. And no, the government is not hiding anything. Everything is available online free of charge! Again, Carson claimed that his wife was also diagnosed with early dementia and her tinnitus was one of the early signs. Well if that’s true, then his claim that her severe tinnitus was reversed in just 21 days is outright false. This is because dementia is a disease condition that slowly progresses and is IRREVERSIBLE [Alz.org]. Next, Carson claims that the purple sweet potatoes (part of the recipe he received from the old woman he met) contains a nutrient called quercetin, which has supposedly been found to regenerate myelin ‘in 30 days.’ He then cited this study to prove his claim. But if you read the report you’ll see that the researchers found that quercetin can boost regeneration of myelin in brains suffering from perinatal cerebral hypoxic ischemia (PHI) in 30 days. In other words, according to the study, quercetin is only beneficial in regenerating myelin in fetuses and newborns, NOT adults! I can go on and on and on but by now I believe you’ve got the point. Tonaki Tinnitus is full of lies, twists and half-truths designed to completely deceive you. Stay away from this product! Final Conclusion: DON’T BUY Tonaki Tinnitus Protocol. It is A SCAM! BuyGoods is the retailer of this program. So if you’ve made the mistake of buying this program, ask for your refund by using this form. Please know that only specialist doctors can help you with your tinnitus. So consult your neurologist or otolaryngologist and related specialists for help about your tinnitus so that they can properly diagnose your condition and proffer appropriate treatment. Feel free to use the comments section to make your contributions. Also don’t forget to share this review to the relevant people so that they will be informed. Thank you! Well you got one thing wrong- Doctor’s cannot help with tinnitus. All the doctors I went to simply told me there is no cure and to learn to live with it. Thanks for posting this. I saw the pop up ad and clicked on it. I thought it looked BOGUS! After losing my mom to dementia, I know more about the disease and when he says dementia is caused by tinnitus and this cured his wife I knew it was false. Dementia, Alzheimer’s disease is caused by brain damage, concussion,or stroke, and is irreversible. Tinnitus is damage to the ear from unprotected loud noises, q tips. I am no brain surgeon but I have enough brains to spot a fake and check the facts. Thank you for exposing this scam, it has saved many of us from wasting a lot of time and money and protecting us from nu-scrupulous people! Thanks for the review. Have had tinnitus for many years and have been told by medical specialists that there’s no real cure for it. I have learned to be able to tune it out to some degree but it’s always there afterwards. Certain chemicals such as caffeine and aspirin products greatly increase my symptoms and staying hydrated eases them. Thanks for the posting. I’m always interested the topic in hopes that someday there will indeed be a break through for this debilitating disease.. Personally speaking, this is more than a scam. It is criminal fraud. Stay far away. Lets agree for a moment, based on your findings that this product is a scam. It is obvious you are speaking for the Alopathic Industry. Can you tell me of any drug that can cure Tinnitus? Dr. JHO….. a gifted surgeon at Allegheny General Hospital, Pittsburgh, Pennsylvania can perform surgery to cure your Tinnitus………………..
Hi, i have purchased the tinnitus protocol myself from Todd Carson……and i did drink every day these miracle smoothies for 21 days but my tinnitus did not go away. Actually what i discovered on internet that research says that GINCO BILOBA does naturally over period of time reverse and cure tinnitus. I tried the Protocol for the full 21 days and did all the things required. It cost me £34 to purchase which I was happy to pay as the video presentation had me convinced it would work. What a waste of money! It made no difference at all and as far as I’m concerned ‘Todd Carson” if he exists is just a slick snake oil salesman. I tried the Protocol for the full 21 days and did all the things required. All effort and money was wasted. It made no difference at all in the ringing in my ears – which I have had for over 10 years since taking some antibiotic medicine for an infection. Advertisement did seem too good to be true. Don’t bother to buy the ‘solution’ recipes.